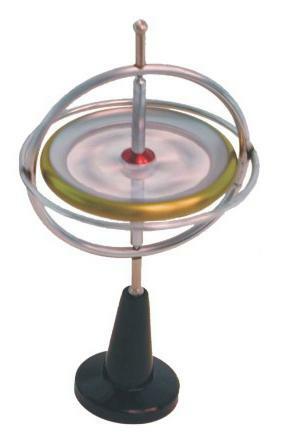 Physics toys allow one to see first hand the different principles of physics in action. They are an easy and inexpensive way to visualize certain concepts which would otherwise be difficult to grasp. I'm going to list some physics toys below which are both fun to use and interesting to observe. The gyroscope is fascinating because when you spin it, it is able to precess and spin around in a circle, all while defying gravity! The behaviour of a gyroscope is explained on my web page: Gyroscope Physics. 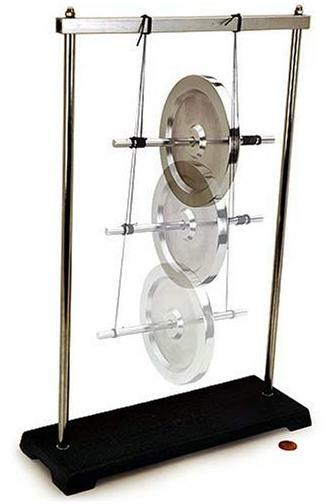 This suspended wheel continuously winds and unwinds up and down a string. It demonstrates the principle of potential and kinetic energy. The wheel gradually loses height each time it winds back up the string, due to friction losses, so energy is not conserved. 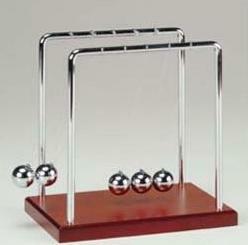 Newton's cradle demonstrates Newton's third law, and the conservation of momentum. 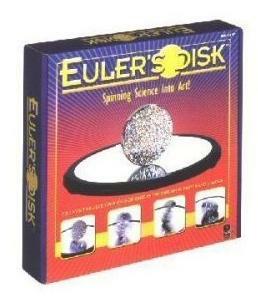 Euler's disk is a large heavy disk that spolls (spins and rolls) for 1-3 minutes before coming to a stop. It is similar to spinning a coin on a flat surface, but it lasts much longer. The behaviour of Euler's disk is explained on my web page: Euler's Disk. See also the science toys page.